Reference: StudentFilmmakers Magazine, March 2008. 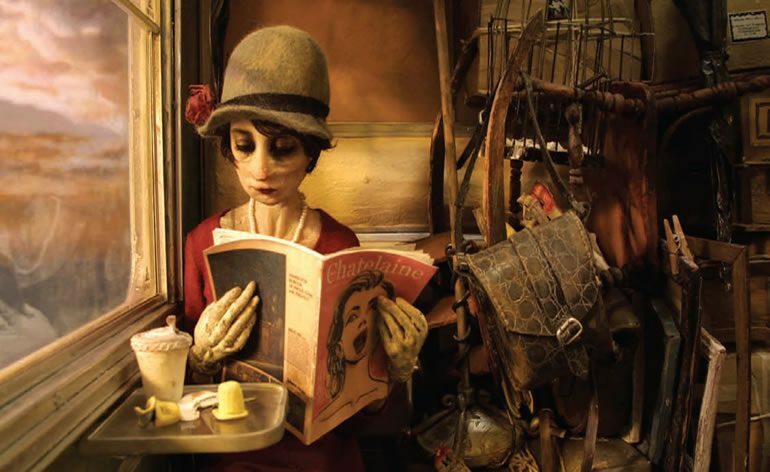 Madame Tutli-Putli’s Journey to the Red Carpet: Lavis and Szczerbowski Bring Human Emotion and Expressiveness to Stop-Motion Puppets in Their 2008 Academy Award-Nominated Film by Mary Ann SkweresFilm. Pages 22 – 26. Bringing human emotion and expressiveness to stop-motion puppets was the most important creative issue that directors Chris Lavis and Maciek Szczerbowski faced as they formulated ideas for what has become their 2008 Academy Award nominated film, Madame Tutli-Putli. Conceived by the filmmakers while on a train trip across Canada in 2002, the film is a stunning, stop-motion animation that takes the viewer on an exhilarating existential journey with the lone Tutli-Putli who, weighed down by the excess baggage of her life, confronts the haunting demons of her past on the night train that carries her to metaphysical worlds somewhere between reality and imagination. In addition to their role as directors, Lavis and Szczerbowski served as screenplay writers, sculptors, animators and art directors. Meticulous craftsmanship informs every minute detail of the production – from the hand-built sets and costumes to the original oil paintings that formed the saturated skies outside the train to the unforgettable live-action eyes of the characters – combining to bring a fully imagined, tangible world to life. The creation of the film, an extraordinarily painstaking process, took 4 years from that green light through completion. The National Film Board of Canada acted as the film’s production company, with Marcy Page and David Verrall producing. The filmmakers credit the NFB with the insight and artistic integrity that made creation of the film possible. The filmmakers chose instead to tape live performances with actress Laurie Maher, on whom Tutli was modeled. “I worked to develop the personality of the character in a similar way to a live action character, so we had a real understanding of who she was, how she moved, how she drank a cup of coffee, how she walked. What was inside this character,” reveals Maher. From these shoots the filmmakers created a “video animatic” that was used as a reference for the action and camera moves as well as for character development and emotion. To bring Madame Tutli-Putli to life, scenes were improvised numerous times with Maher to allow the filmmakers to work out the beats and gestures that translated into the movements of the stop-motion puppets. “We wanted as much as possible to recreate that original spontaneity,” comments Lavis. To create this new benchmark in stop-motion animation – one of the oldest forms of animation – the filmmakers used hand-designed, molded puppets. Rejecting traditional armatures, they constructed the wire aluminum skeletons by hand. Created from molds made from a mixture of silicon, latex and plaster, developed over seven months, the one-of-a-kind puppet bodies used silicon to avoid the joint seams normally associated with the technique. “We did not want to have a line that reminds you that you are watching a puppet,” says Szczerbowski. Different actors were cast for most of the characters. After analyzing the previously shot animation for each scene, human facial expressions were filmed to match the puppet’s motion. The “eye performances” required extensive rehearsal time and detailed choreography, to match each puppet move. Fifteen to twenty takes of each human actor’s corresponding performance were shot per sequence, with variations to allow for the greatest choice of emotions. Care was taken to recreate the lighting and shadow passes of the live-action to the original stop-motion set-ups, as well as match the subtle movement of the puppets, the camera, and the train – all without interrupting the flow of the acting. Opting for a slightly stretched size to boost sympathy for the character, the eyes were then painstakingly selected from among the multiple takes, individually positioned, seamlessly composited frame by frame onto the puppets, painted and re-timed. “…And had a complete pyro weekend,” Lavis adds. “On the beach at night we had total blackness.” The fire effects were then composited into the picture by digital compositor, Peter George, who also added shadows, did wire removal, color correction and other effects. The seventeen-minute film was shot digitally on a Canon EOS 30D. The digital stills were edited together on Final Cut Pro and output to a HDTV master format then filmed out to 35 mm. “I’m proud of the fact that we made a film that evokes a real reaction. The connection with the puppet is not common to a puppet. It is much more common to a performer. We made a film with a performance. There is acting. There is film language. Although everything is miniature, it does not seem like a small version of things. I think we did it right,” says Szczerbowski. Madame Tutli-Putli premiered at the 2007 Cannes Film Festival, winning 2 awards – the Canal+ award for best short film and the Petit Rail d’ Or. It also garnered Best Animated Film at the Worldwide Short Film Festival in Toronto and the Grand Prize at the 2007 Cinanima. The film recently screened at the 2008 Sundance Film Festival. Photos courtesy of The National Film Board of Canada.